Tonight I am going to talk about Dede Ren. This is Lulu’s mom and best friend. Yes it can be done. But Dede is always a mother first. There are a couple of secrets that Dede has ever kept from Lulu. This mom will always put her daughters heart first, before her own. When she had to sit her only child down and tell her about their families connection with a spirit world she knew it wasn’t going to be easy. Not only was there the fear of her rejection of the whole concept, but the dangers involved. The acceptance of the beast was no small matter! (Hint, Hint) No wolves, no mutated humans but something epic! Dede knew of the scars that her own mother (Gram Ren) hid all to well. Dede has to tell her one and only that she will have the fight of her life, and its only just beginning. Unfortunately there are more worries that come with her acceptance. If Lulu survives the challenge, it will be just the beginning of a lifetime of altercations, and problems to come. SEE which character I talk about next! Rese is the eldest living of the remaining elders of the protectors of the spirit world. He has only one enemy. His spirit is the oldest among them all and his name is Nile. Their element is water and they have been together for many decades. Rese is not a man who is easy to be around and is even more uncomfortable around his own kind. But when he is needed Rese won’t let the spirit world down..
Hope you enjoy a little about Rese. I apologizes for the long delay in a new post, I have been working on moving my mom into her new home and my new career as a CCHT. I am back and excited to share who these colorful characters are in this fun book. Hello and welcome back. Tonight I decided to do another random blog about the book. 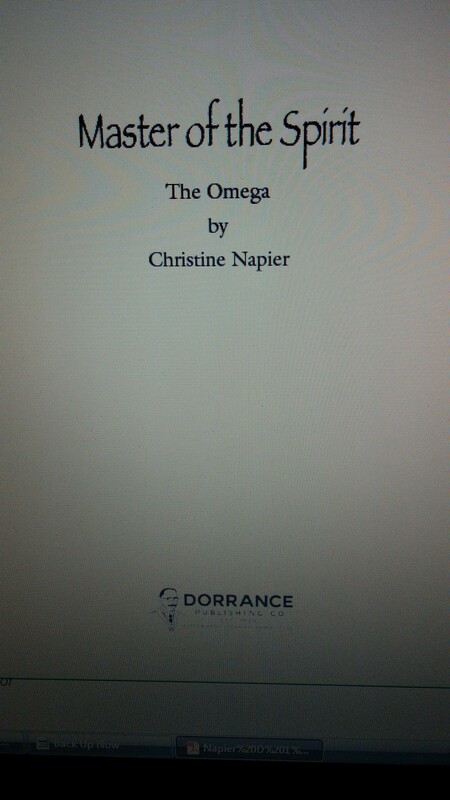 Since the page proofs I have not heard from Dorrance yet. December is still the release month yet I don’t have the date as of right now. Tonight’s blog is rather funny because no matter how old we get we always have someone else to answer to. And our young rebellious Lulu is no different. (even though she detests it, lol) So here is another little snip-it from the book. Again- the reminder all parts of this book is protected by copy right. This particular part is when Matthew and Mani had stepped into Lulu’s business and made it their own. Lulu was not very happy and decided to go into a snit about it. This is where she tells Matthew that she just might go out and find some other form of entertainment. A few words rapidly came to my lips, and I instantly bit down on them. Because I knew very well that Matthew was more than capable of doing just that. And he would totally enjoy the embarrassment that it would cause me. And on that note, I went home. As I stomped my way home, I heard Matthew tell me that he would see me tomorrow. I swear the top of my head was going to blow. Here I was a grown woman, and I had everyone around me telling me what I was going to do. Have a wonderful week and see you again soon! I am beyond excited to share a picture with you all tonight. I was able to look over my page proofs for Master of the spirit. I must say I love them!!!! Thank you all for your continued support and here is the cover page…..
You know by the look in the eyes. Tonight I decided to do another random post. I wasn’t sure I wanted to do this one, but I came to this particular part twice tonight. So, here it is. The eyes are the way into the soul. They show joy, love, sorrow, and fear with little complication. How many times have you looked into someones eyes and known what they are about to say. Your heart sinks when you see the look of sorrow or hurt in those eyes you care so deeply for. When I wrote this I tried to incorporate those feelings into words to describe that look. So here this weeks sneak peek at Master of the Spirit. ENJOY! He set down the spoon and put his arms around my waist, pulling me in close. He nuzzled my neck and shoulder. And it wasn’t until he heard the soft vibrations that he looked me in the face. His eyes: ice blue. But a look of worry was set behind those enchanted eyes. His look was starting to make me nervous. When I traced the lines on his brow, he caught and kissed my hand. On another note I have been asked to get pre-order addresses from anyone interested in purchasing the book when it becomes available. So if any of you are interested you can email me your mailing address and you will receive a flyer from Dorrance. Thank you to everyone for all the support. Have a great week! or comment me here on this blog. I was reading the blogs I follow this week and there is two on the same subject that has stayed with me. The subject is feminism. I don’t want to start a debate!!!! Although I will share my view on the matter. Women are different from men! Some women are larger than men and some are smaller. We are all created in a variety of shapes and sizes. No, personally I can not do the same job as a professional carpenter. I lack the size and skills. But, I can be the best dialysis technician that I can possibly be and the best writer to my followers. I believe that a man shouldn’t hit a woman, and a woman shouldn’t hit a man. Believing in being equal to a man shouldn’t mean that either one has to be superior. Its called compromise. So, on that note my blog will be on Mani tonight and his Man Card! lol It’s for fun, and is meant for enjoyment. So enjoy! Mani walked around and stood in front of me. I had been setting on the bed waiting for the talk about the dominance. We were going to have to come up with some kind of agreement on that. Now it had to be said. I tried my hardest, but the tears were coming again. I guess today was a day for tears. When I looked at him, I wanted him to know how much it had hurt me when he treated me that way. He got down on his knees and lifted my head so we could see eye to eye. I hope you all have a great week! Be safe and see you again next weekend.